That Jetty is—by design—subject to the chaos of nature and decay. It was a place where, as Smithson wrote, “No ideas, no concepts, no systems, no structures, no abstractions could hold themselves together in the actuality of that evidence.” Leegte’s jetty, though, isn’t subject to that kind of change. The monitor could break or the lights could go out, but the Minecraft jetty won’t sink under water or crumble apart. It exists in an algorithmic landscape, which embraces variability within the limitations of a database. Further, it doesn’t exist in Minecraft’s networked open world. It can’t be visited or interacted with by Minecrafters. With online interactivity fast becoming a euphemism for data-mining, Leegte’s works emphasize the purely spectatorial. Leegte’s recent Portrait of a Web Server (2013) also replaces interaction with watching: it is a website that consists simply of auto-scrolling code. 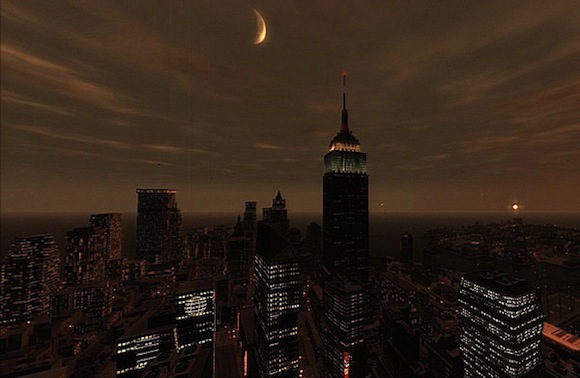 Still frame from Phil Solomon, EMPIRE (2008-2012). Peggy Ahwesh, She Puppet (2001). Leegte’s Jetty has something in common with other instances of experimental machinima. In particular, it recalls Phil Solomon’s EMPIRE (2008-2012), a remake of Andy Warhol’s eponymous film over the course of a day in Grand Theft Auto IV. Both have translated aesthetic icons into gamic environments, which they bring to a resting algorithmic heart rate: with no user input, the feedback loop’s resonant frequency emerges. This approach is different from Peggy Ahwesh’s She Puppet (2001), which deploys footage of Tomb Raider played actively against itself, with Lara Croft brought endlessly to her death. Leegte and Solomon, in contrast, rely on the game’s potential as much as they withdraw from gameplay. Digital worlds like Minecraft are programmed with negative entropy, maintaining order through rules that allow for possibilities of “free play” without descending into uncontrolled chaos. Negative entropy keeps interactivity running smoothly. Denied interaction, we are faced with an image of pure possibility and pure limitation. 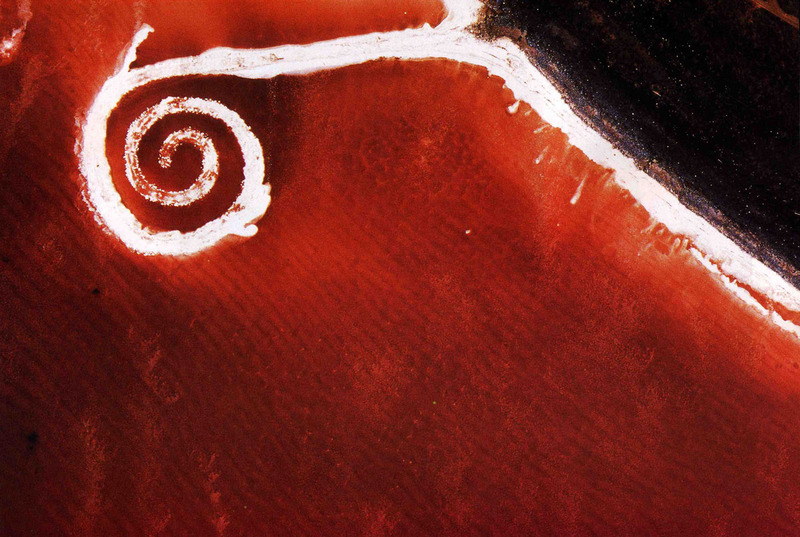 In their original incarnations, Empire and Spiral Jetty both relied on dynamics of change, from 8 hours to eternity. These works will not transform that much. The apparatus that creates the possibility for the work also assigns its limits. Without interaction, we see both: the open, algorithmic world at the edge of its functions. If Smithson’s Jetty was a place where nothing could hold together, Leegte’s reveals that the greatest illusion of these digital images is that they could appear cohesive at all. Even the synchronic, homogenous regime of code still contains a seed of entropy. Even without constant change, the image remains always potential. 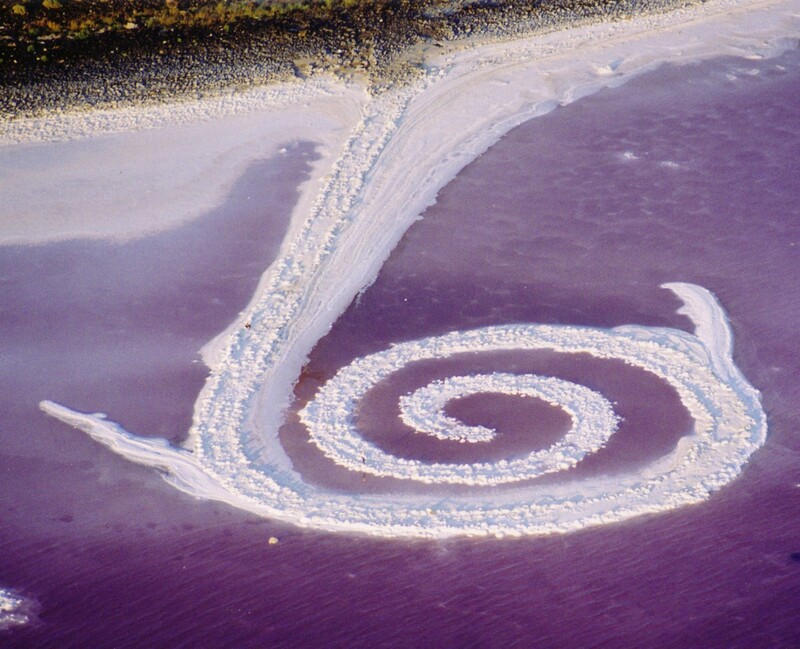 Remake of Robert Smithson’s Spiral Jetty in Minecraft resides between the limits and potentialities of the synthesized image. I agree wholeheartedly with the first sentence of this piece: "Jan Robert Leegte’s title leaves little to be explained." And yet the author subverts his impressively efficient critique by following it up with over five hundred additional words. Which is more than a little. I believe artists working within a (vaguely) contemporary technological mode would do well to avoid relying so heavily and exclusively on the aura of historical works to distinguish their endeavors. Perhaps investigate other vernaculars with which to communicate ideas, assuming they exist to communicate? This is lazy, dull, easy work. If the point has not yet been reached where everything is already made and remade, someone please create a bot to troll ARTstor, remodel, reenact, or otherwise recreate its entire archive in various virtual environments, and be done with it.